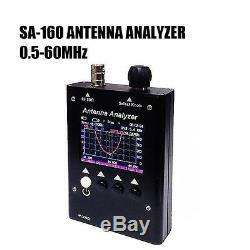 SA-160 antenna analyzer designed for testing, checking, tuning or repairing antennas and antenna feed lines. (Standing Wave Ratio) and impedance measurement instruments (vector impedance analyzer). Make SURECOM attractive for professionals and hobbyists. It is quite important that graphical display of various parameters over a wide frequency range is a key feature of these analyzer which significantly reduces the time required to adjust an antenna. 2.2 precision LCD screen, High-lumen LCD brightness, easy to read in direct sunlight Heavy duty Aluminum enclosure, strong anti-interference ability. Very compact and convenient for field use Built-in rechargeable Li-ion battery Full Band control (No need select Band) Easy setup, only four control buttons with convenient on-screen soft menus Constant Battery Status Indicator and Auto Shut-off Built-in timer shows elapsed time when unit is turn on High efficiency IC, low power consumption, the longest working hours More choice measurement frequency Span. 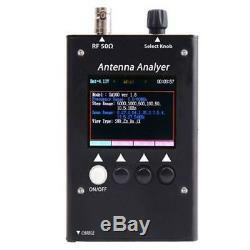 One button quick scan mode HF1, HF2, HF3 or 3 band by full screen. Auto marker the Best s. 1-1.5V(5 - 10dB). 3.7V 900mah , Li-ion 14500. 0.54MHz/1.35MHz/2.7MHz/13.5MHz/27MHz/62.1. Two-color LED Hidden (when not charging) there are three instructions state: 1, charging (red) ; 2, charging is completed (green) 3, Battery fault (flashing). 70 x 120 x 25 mm. TFT LCD 320 x 240 pixels. Size 14500 of Lithium battery. Smart charger, LED charging-status indicator. On-screen DVM, plus battery condition icon. Auto-off timer, Auto Run/Stop RF generator control. 0.27/0.54/1.35/2.7/5.4/13.5/27/62.1MHz. 2.2 inch high-output color TFT. 4 button, with on-screen (soft-menu) identifiers. Rotary encoder with press-in tuning-step selection. 7 cm wide x 12cm height H x 2.5 cm. 6.1 oz (0.172 kg). Turn on and off the power. Turn on the power, Press and hold White button when the dot disappear from left up angle. Top Menu appeared on the screen. Turn off the power, You have 2 method : aOn Top Menu page , Press and hold the White [F1] button at 5 second. BOn Top Menu page , Rotary encoder on "Power off", Press the [F2 Enter]. You can turn the knob select you want function and press F2. 2.0 ANTENNA TEST EXAMPLES by Scan mode. In the Top Menu screen: Rotary encoder on "Scan", Press the [F2 Enter], to frequency mode measurement button, enter Scan­ (scan mode) screen. 2.1[Scan] mode page. 2 scan , button to start the scan operation. During scanning, in order to make sure measurement accuracy, each frequency will stay for short while. One scanning cycle will take about 1-2 seconds. Once SCAN is done, it will enter Present mode (result) screen You have results on the screen : Show the SWR curve only (because default setting SWR curve only , Zx curve, Rs curve Disable) You can Enable other curve on the screen: On Top Menu page, Rotary encoder on "Zx", Press the [F2 Enter] to enable. Other cure will Disable when Power Off , If want enable in the future, Rotary encoder on "Save", Press the [F2 Enter] to save setting. Lnfull (default SCAN range 0.56MHz -59.9MHz, span 62.1MHz). Long press to [SCAN]and press [F3 UPDn] select 1. Infull, and then release the scan button. LrnMk=(Learn marker move to center frequency) Long press to [SCAN]and press [F3 UPDn] select 2. IrnMk, and then release the scan botton. View the scan frequency point on the curve on each scan of the specific parameters of the measurement results. View button to start the view operation mode. Rotary encoder , the white triangle curve marker is move - Dot scale will display on-screen, Press bottom change the Dot scale, You have 3 options of Dot scale mode for choose, [Dot =x1] [Dot=x10][Dot= x25]. (230KHz, 2.3MHz, 5.8MHz) SWR Full scale will display on-screen, Press bottom change the graphically plot SWR, You have 3 options scale mode for choose, [SWR=x2][SWR= x 0.5][SWR=x1]. 2.4[Quick 1] start Scan mode. Quick view the scan frequency point on the curve on each scan Press the button [Quick 1] to start the Quick 1 operation mode. You have 3 options scan mode for choose. Scan 1 0.5 to 27.3MHz can of the specific parameters of the measurement results. Scan 2 16.6 to 43.4MHz can of the specific parameters of the measurement results. Scan 3 33.6 to 60.0MHz can of the specific parameters of the measurement results. 3.0 ANTENNA TEST EXAMPLES (Single mode). In the Top Menu screen: Rotary encoder on "Single", Press botton "F2" single ­frequency mode measurement button, enter single­ (single scan mode) screen. Rotary encoder potentiometer enter the center frequency, the specific reference to the above operation "SCAN" sweep measurement mode descriptions. Press the F2 scan, to start the scan for one time. Single ­frequency mode provides a single frequency impedance measurement, the measured frequency of the basic parameters have been displayed on the screen. And to indicate the form of bars and numbers displayed on the screen quickly. The scanning one time , will stop, until you press the F2 Scan button or rotary encoder potentiometer enter the center frequency. In this mode, it can be used as an accurate signal generator, please refer to RF out. 1 x English Users Manual 1 x Micro Usb Charger Cable 1 x AC Adapter 100-240V (Depends on your country). We work very hard to provide the best representation of style and the color of the product through our photographs and descriptions. The real color of the item may be slightly different from the pictures shown on website caused by many factors such as brightness of your monitor and light brightness. We love questions, so ask away! It takes approximately 15-25days(USA, CA, AU, UK). Monday to Friday (excluding Holidays) - We do not answer any emails over the weekends and holidays. 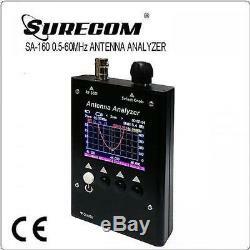 The item "Surecom SA160 Color Graphic Antenna Analyzer 0.5-60MHz for Two Way Radio Testing" is in sale since Tuesday, March 21, 2017. This item is in the category "Consumer Electronics\Radio Communication\Other Radio Communication". The seller is "chinesedreamhong" and is located in Shenzhen, . This item can be shipped worldwide.